GateKeeper is a ticket deflection feature that improves the in-app experience and reduces your support load. 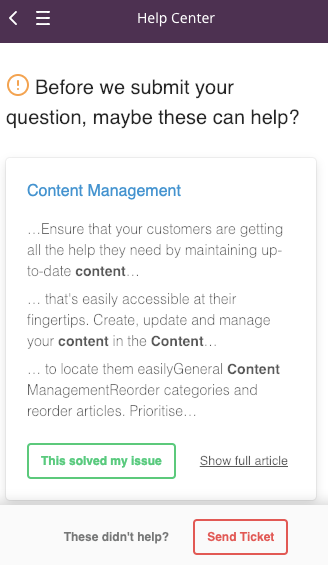 When your user enters in their query in the support module, GateKeeper tears apart their request to find the most relevant sections of the most relevant articles in your knowledge base and presents them to the user as suggested help. It's like having someone on your support team respond to the customer before the ticket is even submitted. Click the pencil icon next to the support module to edit it. Note your module may be called something different. Activate the Enable Ticket Deflection option. Wait a couple of minutes for the change to take effect. How do I know if it's doing its job? To help bring extreme clarity to your team and show you where people are getting stuck, you can view a report that will show you what the customer intended to send, what suggestions they were delivered, and which suggestion solved their issue. This means you're able to uncover where things are causing friction in your product, even when you don't hear about it. You can also identify gaps in your content and plug them as you see fit. Before a user submits a ticket, GateKeeper analyzes its content to extract the subject and intent, and uses them to surface the most relevant sections of your knowledge base articles. They can then read through the highlighted snippets and decide if any of them solved their issue. Depending on how they interact with the suggestions, the ticket will be classified based on the criteria documented here. How do I influence the suggestions? As a general rule, the more comprehensive and up-to-date your knowledge base, the more likely it is that GateKeeper will surface relevant suggestions to the user. This article provides a few tips on how to keep your content relevant and healthy. That said, there isn't a more direct way for you to influence the suggestions just yet. As GateKeeper matures and your users interact more with it, we'll be able to improve the suggestions further by letting you associate an underperforming ticket with the right article so you'll have more control over what gets surfaced. We'll keep you posted as soon as this feature becomes available.